Say it with words. 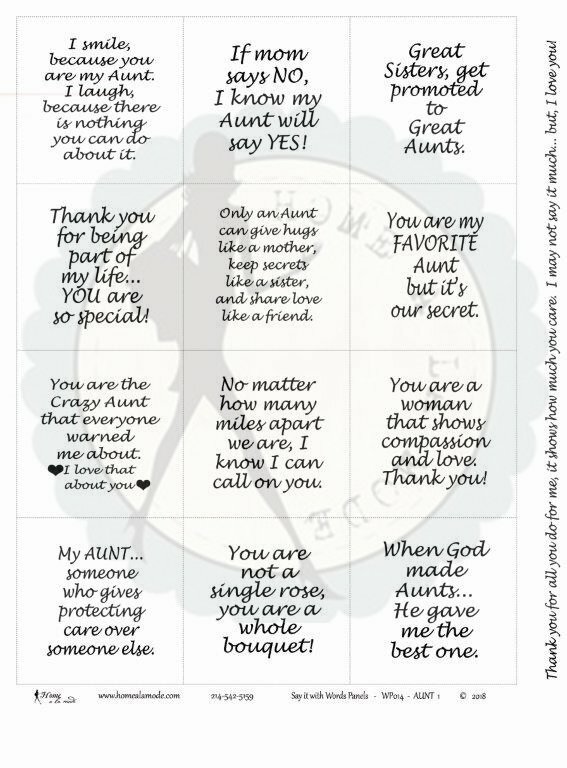 AUNT is a Home a la mode word panel that is all about the serious side of our feelings and the fun quips for our Favorite AUNT...like: I smile, because you are my Aunt. I laugh, because there is nothing you can do about it. - If mom says NO, I know my Aunt will say YES! - Great Sisters, get promoted to Great Aunts. - Thank you for being part of my life... YOU are so special! - Only an Aunt can give hugs like a mother, keep secrets like a sister, and share love like a friend. - You are my FAVORITE Aunt but it's our secret. - You are the Crazy Aunt that everyone warned me about. I love that about you. - No matter how many miles apart we are, I know I can call on you. - You are a woman that shows compassion and love. Thank you! - My AUNT... someone who gives protecting care over someone else. - You are not a single rose, you are a whole bouquet! - When God made Aunts... He gave me the best one. - Thank you for all you do for me, it shows how much you care. I may not say it much... but, I love you!